This is one of my favorite comfort foods. It is not one of the healthiest meals I cook, but oh so good. It has also become a go to recipe for when I am in a hurry or don't have any fresh ingredients on hand. I adapted it from a Real Simple recipe. The original recipe calls for 2 lbs of gnocchi, which is 2 packages of the shelf stable gnocchi you find in the pasta section. That just seemed like a lot to me. Plus I wanted to add some protein so that it would be a complete meal for me. So I added the white beans and reduced the amount of gnocchi. 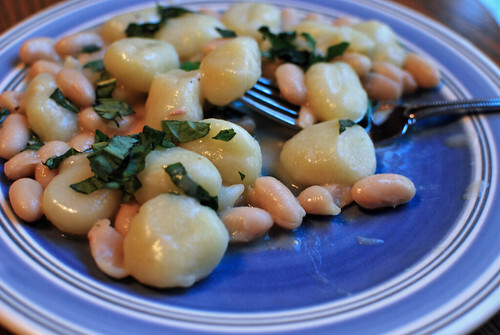 I know they sell gnocchi in the frozen section at Whole Foods, which I am going to try next time I make it. I usually use the shelf stable kind. If you are feeling really ambitious, you can also make them from scratch. Cook the gnocchi according to the package directions. Reserve 1/2 cup of the cooking liquid, drain the gnocchi, and return them to the pot along with the beans. Add the butter, mustard, the reserved cooking water, 1/2 teaspoon salt, and 1/4 teaspoon pepper and toss until the butter has melted. Fold in the basil and chives. Serve it with a side salad or sauteed spinach and you're done. oooh, that looks fabulous! I will definitely be trying this recipe - thanks! looks yummy! I might have to try this one! Looks good, thanks for the recipe!